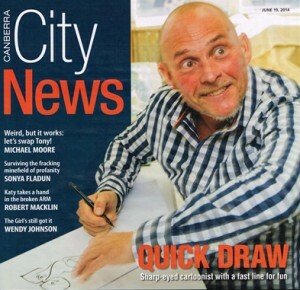 A study of concentration with a keen sense of fun, Andy is seen striking a familiar pose on the cover of City News in June 2014. IT’S been a long road, but cartoonist Andrew Hore is making a living from drawing funny pictures, and he got himself there by combining his lightning fast scribbling skills with social work. “What I do, it mightn’t appear it’s that serious, but I take it awfully seriously,” he says, explaining that the programs he runs have to be meaningful for each group he delivers them to, whether it’s schoolkids or prisoners, people with mental illnesses or those who simply want to learn how to draw cartoons. “I guess the advantage of finding my little niche is that no-one does what I do – touch wood – and I’m thankful for that, but I’ve got to do it properly and that means doing it so it adapts to each group.” Andrew talks fast and he draws fast, too, whipping up a caricature of yours truly in under a minute, looking up every now and then for a split-second glance at his subject, eyes wide, his face a maniacal expression of concentration. Read the full article here.